We thought that this might be a good time to tell the story (so far) of how we’ve developed Fabulous Beasts’ technology, a tale of invention, careful compromising and finding the fun in circuits and sensors. So our engineer is Chris Shaw, whose mixed-disciplinary interests were perfect for the task Fabulous Beasts has set him. 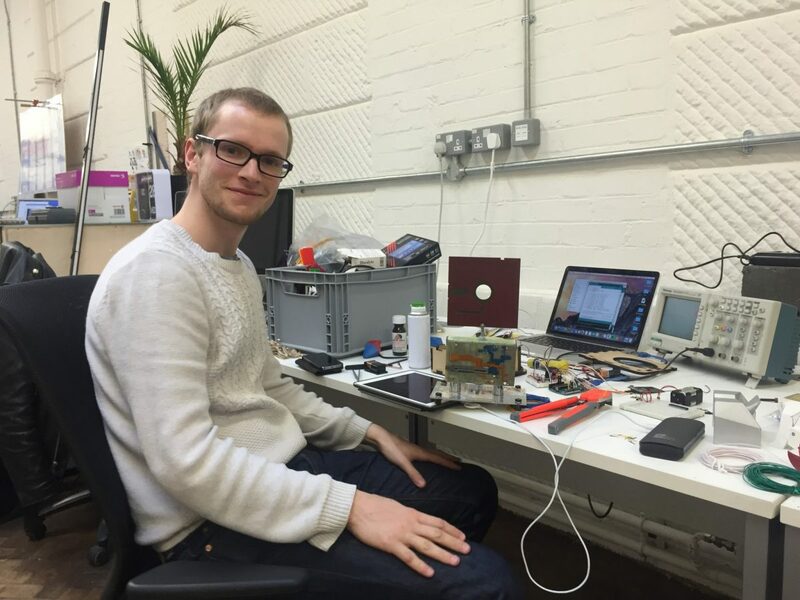 He’s a recent graduate of the University of Bath, where he studied mechanical engineering but soon started mixing in electronics, ending up designing and building projects like a 3D controller to fly drones. He met Alex Fleetwood, our CEO, last year, having won a bursary to remain at the university. Alex was looking for an engineer to work on a collaborative project between academics and makers, and Chris was perfect. The project was baby Fabulous Beasts. But it didn’t look anything like it does now. Alex gave Chris an open-ended problem: what sensors would be needed to help detect objects as part of a fun stacking game? Chris embarked on a big exploration of technologies that are out there, trying out capacitive sensing, pressure sensors, load cells, microphones… The big dream was a game that could sense a stack of blocks in full three dimensions, knowing the exact placement of each. But that dream led Chris to a frustrating conclusion: it was impossible outside of a lab. And so Chris drew up a research document that admitted failure. But, really, the goal was to make a game, not just clever tech, and what Chris’ document actually did was to identify constraints for the project. It acted as catnip for Alex and game designer George, who quickly fell into thinking about some of the specific technologies Chris had investigated for their capacity for fun, particularly load sensors and RFID. Fabulous Beasts was well on the way. Chris built the prototype game bases that have followed using the Arduino platform, which he chose for the ranges of pre-designed modules that are available, which allow him to create mock-ups quickly. His focus has been on developing three core technologies. Inside the Fabulous Beasts base is an RFID reader, which takes unique IDs in each game piece, a little like a barcode scanner. There is also a weight sensor: a load cell. When a piece is scanned, the hardware knows the weight to expect to be added to the tower. It’s kind of like the equivalent to the infamous “Unexpected item in bagging area” warning at supermarket self-checkouts. Fittingly, it’s also caused the biggest challenges. Load cells spit out very low voltages that need to be amplified, which can lead to big dangers of incorrect measurements. It often looked a little intractable, but Chris solved it using a super-precise integrated unit from Texas Instruments that includes a amplifier and analogue-digital convertor in one neat package. And finally, there’s a Bluetooth module, which sends processed data to a connected tablet. This brings us to today, and that award. The Fabulous Beasts hardware is now pretty bulletproof at running the game. It recognises pieces and registers them on the platform smoothly, allowing fun to be the only thing that matters when you play. At a time when big game companies are spending hundreds of millions of dollars on super-sophisticated augmented reality systems, it’s exciting that a small team like ours can create a genuinely fun experience out of such simple stuff. If you’d like to keep up with news on Fabulous Beasts, including updates on our upcoming Kickstarter and early bird offers, sign up to our newsletter!